There are shrines everywhere in Japan - but only a handful are called jingu. Meiji Jingu is one of them, and enshrines Emperor Meiji and his Empress. There are shrines everywhere in Japan - but only a handful are called jingu. This suffix shows that they enshrine a past emperor, or otherwise share a significant connection to the imperial family. Meiji Jingu is one of them, and enshrines Emperor Meiji and his Empress, who reigned from 1867 until 1912. After Emperor Meiji passed away, the people of Tokyo declared their desire for a shrine dedicated to him, and so the construction of Meiji Jingu began in 1915. It took five years to complete, finally being finished in 1920. The site of Meiji Jingu was once nothing but wilderness, but with the help of 110,000 volunteers, over 120,000 trees of 365 varieties from Japan, the Korean Peninsula, and Taiwan that were planted here. These trees were planted with the hope that one hundred years later a forest would flourish, and that this rich ecosystem would be loved by many - and this hope has certainly come true today. This sacred space is kept immaculately clean and any fallen leaves are diligently swept up. These leaves are then returned to the forest to let nature take its course. 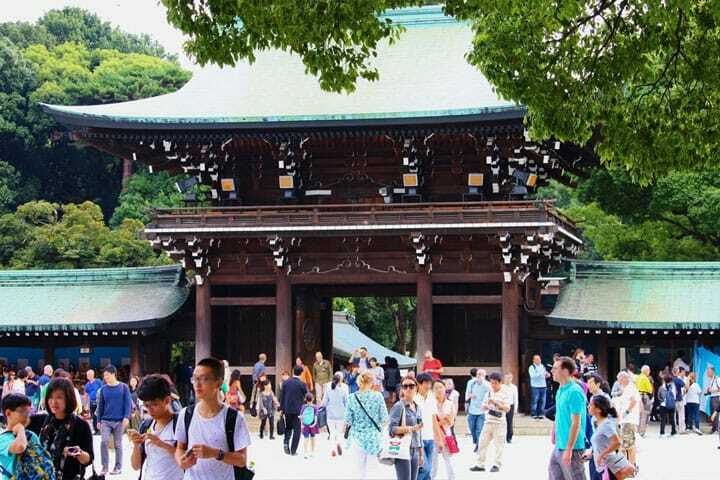 Through the southern and northern path to the shrine meet you'll find the symbol of Meiji Jingu: the torii. This large gate stands at the entrance to the shrine, symbolizing the borderline between the human world and the land of the Gods. Meiji Jingu is actually home to the world's largest wooden torii, with a height of 12 meters and a width of 17.1. The individual pillars alone are 1.2 meters wide, and weigh an astounding 13 tons! However, the gate that stands here today isn't the original. In 1966, the first torii was destroyed by a lighting strike. When this happened, Yasushi Kawashima, a timber merchant from Tokyo, declared that in thanks to the Gods who watched over him and his business, he would put everything he had into rebuilding it. Kawashima travelled many a time to Taiwan. Once, when visiting Dan Mountain, 3,300 meters above sea level, he discovered a gigantic, 1,500 year-old Japanese Cypress tree - the perfect material for a torii. Where there was nothing but a steep precipice, he built a road, and with the help of the local people, took down the enormous tree. The current torii that welcomes visitors into Meiji Jingu is the result of years of his effort, and was finally completed in 1975. Many events take place at Meiji Jingu throughout the year. First, from around the 5th to the 7th of January, there is a ceremony dedicated to Japan's national sport and past sacred ritual, sumo. A spiritual ring purification ritual is conducted by the yokozuna, the highest rank of sumo wrestler. This event is extremely popular, as it's a rare opportunity to see the yokozuna up close. Then, on the 11th of February is Kigensai, a festival which celebrates the founding of the nation. This is Meiji Jingu's biggest festival, with around 5,000 people participating in a parade with 14 mikoshi, and tens of thousands of people coming to watch every year. Every month, excluding August, there seems to be some kind of event taking place here - whether it's the Ningyo Kanshasai (pictured above) on October 4, which commemorates dolls, or the year-end ritual Joyasai. In addition to these yearly events, there is a daily event called Nikkusai, a sacred food offering to the Gods which takes place from 8 a.m. to 2 p.m. If you want to witness a sacred ritual unique to Japan, this is the best time to visit. Meiji Jingu is also a popular place for wedding ceremonies. Above you can see the bride, dressed in a white kimono called shiromuku, walking underneath a red umbrella. It's not as though weddings take place every day here, though, so if you manage to catch a glimpse of a gorgeous scene like this, consider yourself lucky! If the couples that get married here have children, when they are born, and when they reach three, five, and seven years old, they will return for prayers for their growth, and the family will form a long relationship with the shrine. This is Meiji Jingu, the shrine that has been built, protected, loved, and passed down throughout generations by the people of Japan. Why not visit this green city-center oasis, and see if it touches your heart, too? Top 7 Souvenir Shopping Spots In Omotesando And Harajuku!